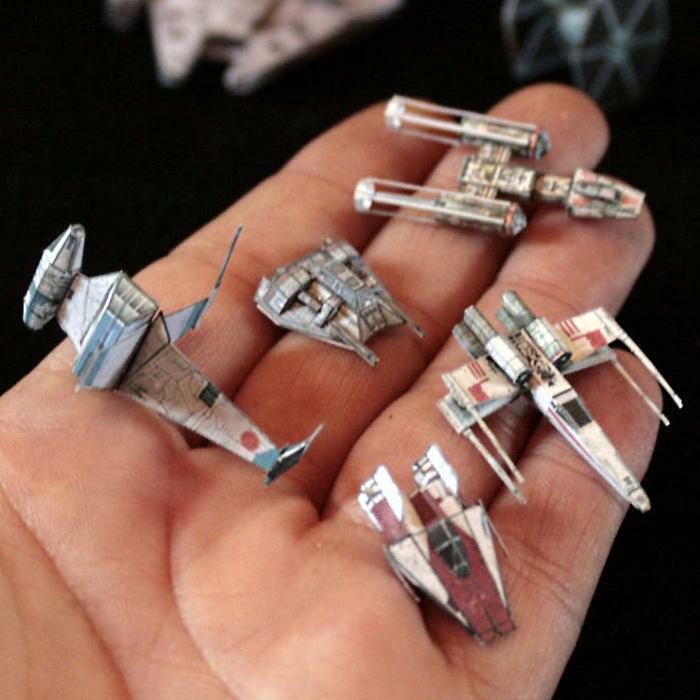 Miniature gaming fan Momir Farooq has a collection of twenty three Star Wars starships available for download. 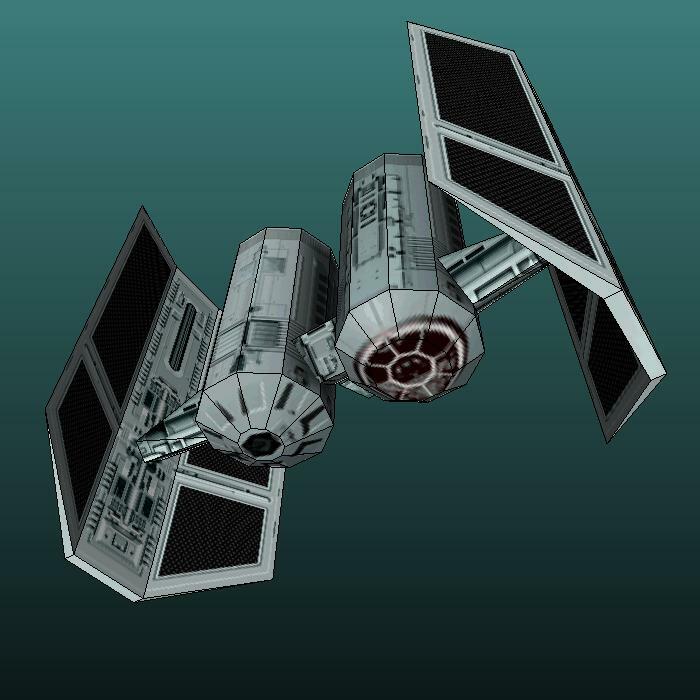 The tiny paper models are intended to be used with the Star Wars Miniatures gaming system. Pictured are a B-Wing, a snowspeeder (technically, not a starship), a Y-Wing, a X-Wing, and a A-Wing. These starships along with other ground vehicles may be downloaded here. Build photo above is by ThunderChildFTC at DeviantART. This is my favorite papercraft Predator mask out of the three that are currently available (see the other two masks here and here). It's my fav for a couple of reasons. First, it has a finished interior that the others don't have. Second, it comes with a display stand. I especially like the little skulls on the side. 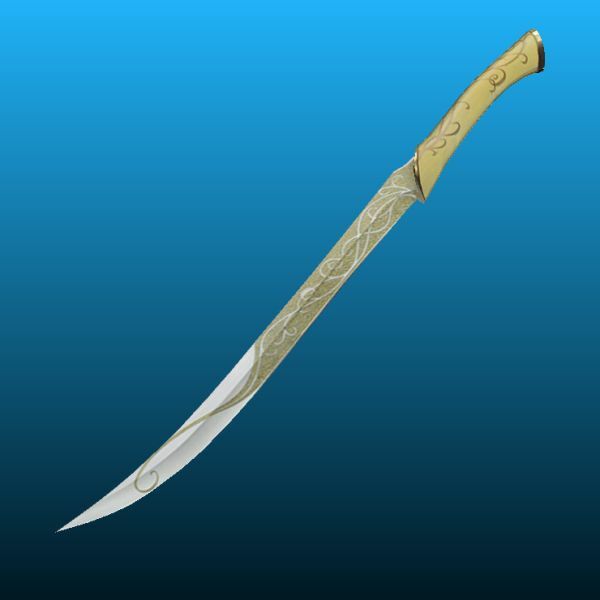 ^^ The template for this 1:1 scale paper model was created by Noturno Sukhoi and may be downloaded here. 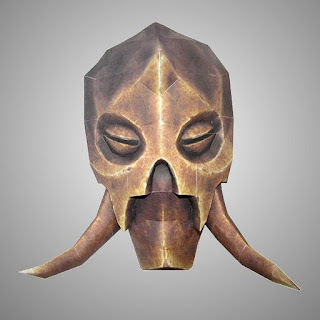 After releasing papercraft templates for the first nine Skyrim dragon priest masks, Brandon has finally released a template for the tenth and final mask. 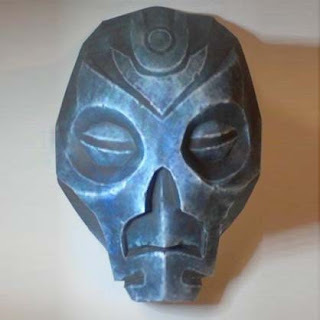 This is the Konahrik mask. Konahrik literally means "warlord". The Pepakura PDO and PDF templates for the mask may be downloaded here. The build photo above is by Cotton-Eyed Joe. 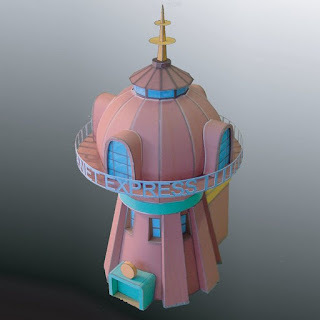 In the Futurama animated television series most of the main characters work for an intergalactic delivery service known as Planet Express, Inc. This paper model of the Planet Express headquarters building was created in 2006 by J. Muller at JM Precision Cardmodels. Despite being released several years ago, the free papercraft template is still available for download here. Construction of the model may be tricky for papercraft newbies as not all the parts have gluing tabs. "There exists an ancient order originating in the Ionian Isles dedicated to the preservation of balance...This order is known as the Kinkou and it employs a triumvirate of shadow warriors to uphold its causes in the world. Kennen is one of these shadow warriors, entrusted with the sacred duty of Coursing the Sun - tirelessly conveying the justice of the Kinkou." The finished papercraft measures 8" (20.3 cm) tip to tip. The template may be downloaded here. "Steam Santa makes gifts for all the good girls and boys, shrinks them down to the size of a spec and carries them in a magical utility belt. 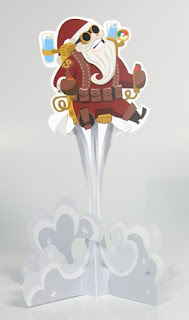 He can be seen each December, zooming around the world on a wondrous steam-powered jet pack, delivering holiday joy." 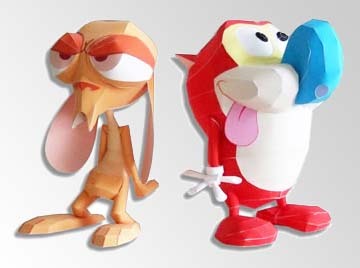 As with all the delightful creations from Desktop Gremlins, this three piece papercraft is glue-less and easy to build. The printable template for Steam Santa may be downloaded here. 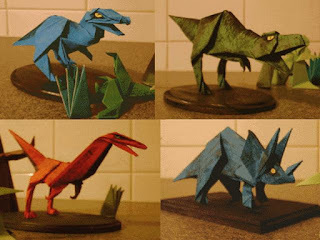 Here is a sampling of some of the wonderful origami dinosaurs at Stephen O'Hanlon's website, fishgoth.com. Pictured (from the upper left and going clockwise) are an allosaurus, a tyrannosaurus, a triceratops and a coelophysis. Sixteen different dinosaurs are available in all. Once at fishgoth.com, click on the photos of the dinosaurs to download the folding diagrams. This cute papercraft piggy bank is named "Shnekel" after the nickname for an Israeli coin. Traditional piggy banks must be broken in order to get the coins out. This bank, however, must be cut with scissors. Denise, who lives in Israel, created the piggy in 2008. Its template may be downloaded here. 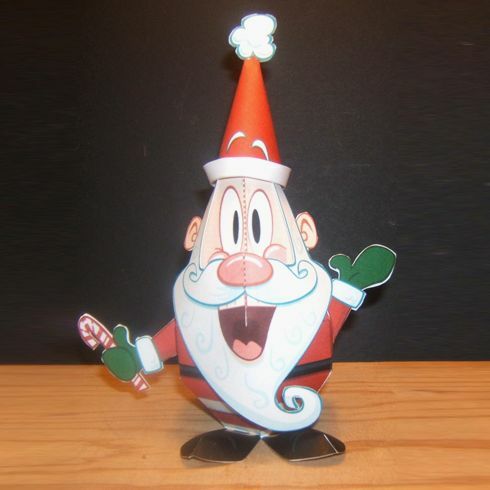 Just a quick note... For those of you that like to follow websites by Google+ and Twitter, I have added Tektonten Papercraft accounts for both these social media sites. Other ways to follow Tektonten Papercraft include Facebook, e-mail, RSS feed, and Google Friend Connect. Look for links to each of these at the right side of the page. Thanks! 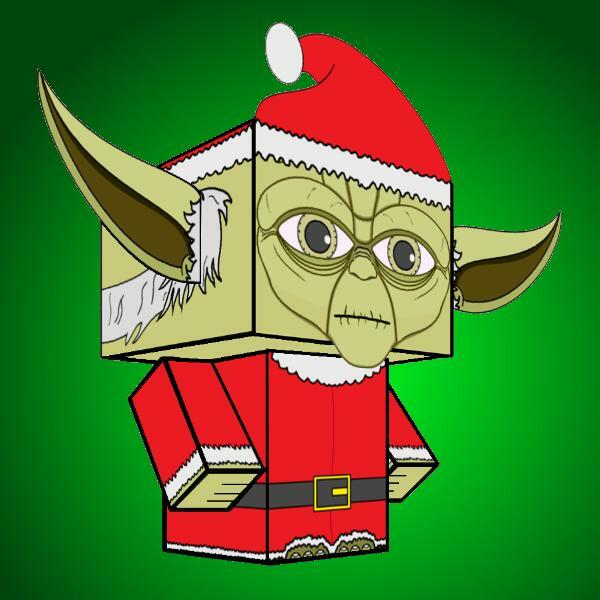 If you are looking for paper toys that combine Star Wars and Christmas, this is your lucky day. 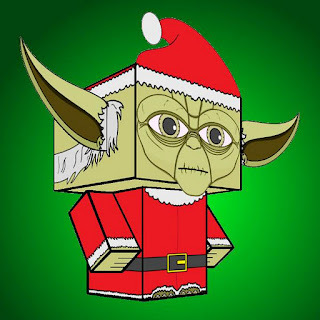 ^^ For the 2011 holiday season, Cyberdrone has released a cubee Yoda dressed as Santa Claus. 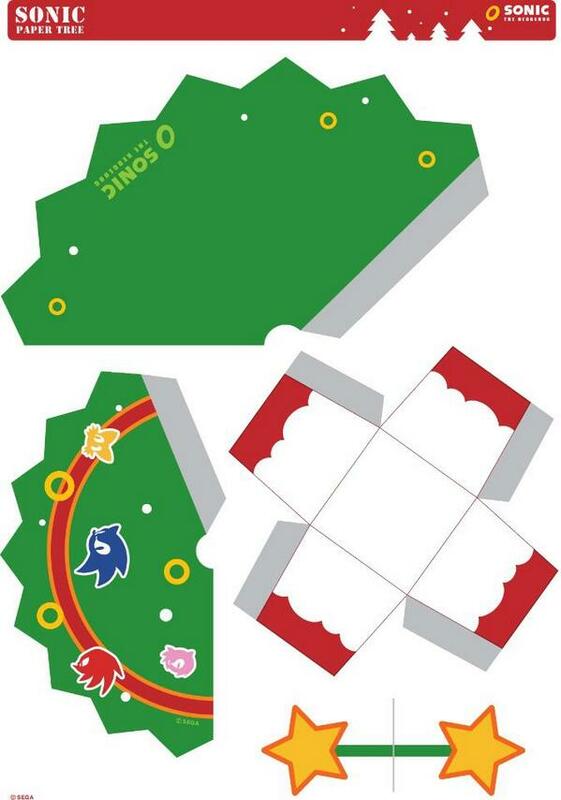 The glue-less template for the toy is available here. See this previous post of mine for more Star Wars cubeecraft by Cyberdrone. Well I guess I am jumping on the Skyrim papercraft bandwagon. 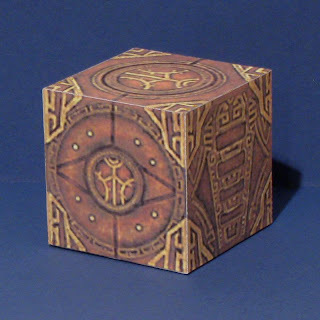 ^^ Given my fondness for decorated cubes, it is only fitting that my first Skyrim model is a Dwemer puzzle cube. In the Elder Scrolls video game series, the Dwemer are a lost race that lived underground. 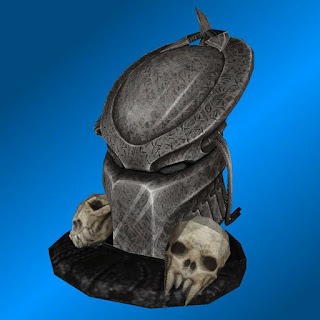 The Dwemer are referred to as "Dwarves" in some parts of the game. The simple one page template for the puzzle cube may be downloaded here. Special thanks to Paperjon at CFSG Papercraft for supplying the textures used in creating this paper model. This is the last papercraft treasure chest I plan on doing for my Kingdom Hearts II treasure chest series. However, I might be talked into doing a couple more if there is enough interest. ;) In the KH2 video game, this treasure chest is found in the Christmas Town area which in a certain sense is a subset of the Halloween Town area. 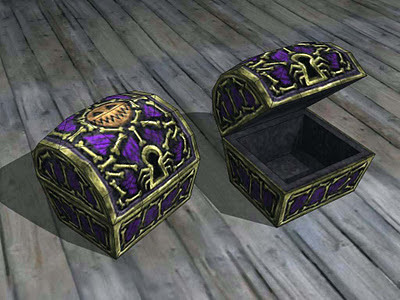 The template for this chest may be downloaded here. The previous chests in the series may be viewed here. In the Skyrim video game there are ten different dragon priest masks to be obtained. Each of the masks grants the wearer different abilities. 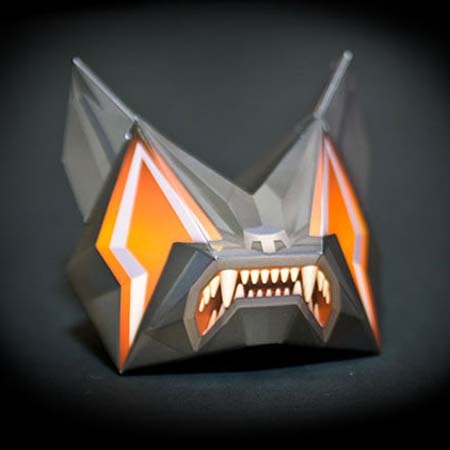 Z8-0 (Brandon) at DeviantART has created papercraft templates for each of the ten masks. Pictured above is the Morokei mask. The templates for nine of the ten masks are contained in a single Pepakura PDO file with interchangeable textures. The tenth mask template (the Konahrik mask) will be released by Brandon after a contest of sorts. The template is available here. "The TIE bomber has two hulls next to each other; one carries the pilot and the other carries a pair of general purpose warhead launchers enabling the ship to carry a variety of weapons tailored for the mission." My favorite TIE bomber memory from the Star War films is when in The Empire Strikes Back the TIEs bombard the asteroid where the Millennium Falcon is hiding. 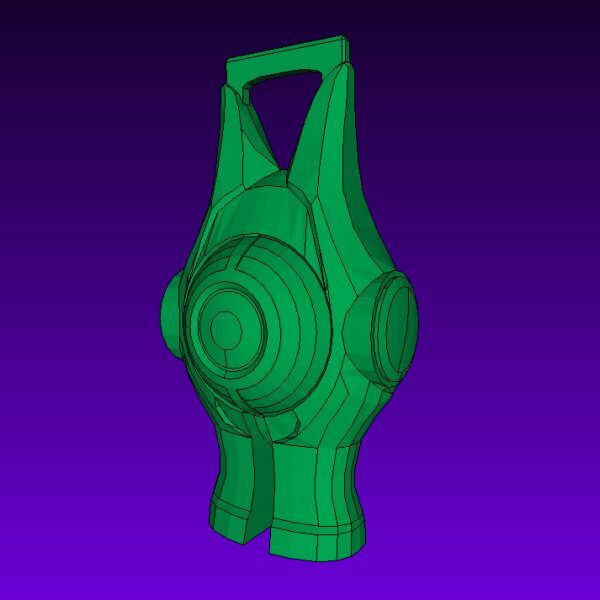 The Pepakura PDO template for the spacecraft may be downloaded here. Tintin is the star of the long running European comic book series The Adventures of Tintin. This month a movie based on the series is scheduled be released (directed by Stephen Spielberg and produced by Peter Jackson!). Above is a sampling of some of the Tintin paper models currently available. 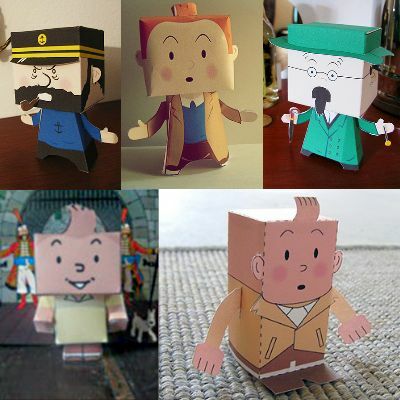 In the top row are Captain Haddock, Tintin, and Professor Calculus paper toys by Cleber Machado. Below are a cubee Tintin by BasaBasiBusuk and a Tintin paper toy from Toy-a-day. My papercrafter cohort Brandon appears to have been busy this Thanksgiving holiday cranking out papercraft models from The Elder Scrolls V: Skyrim. 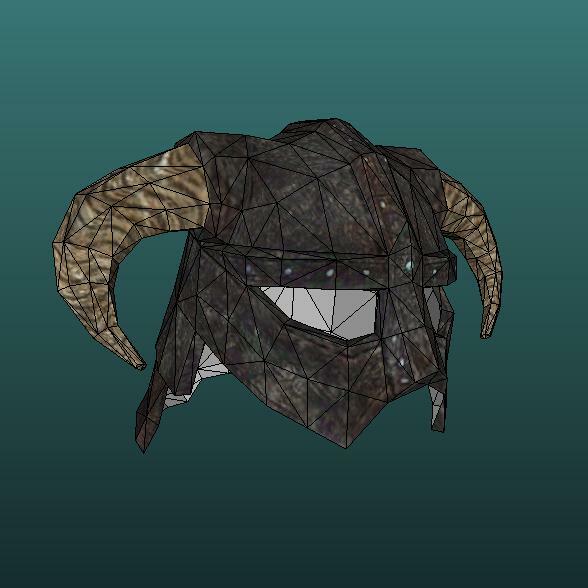 This iron helmet paper model is his fourth Skyrim papercraft to be released in the past two days. This particular helmet is the one the playable character is shown wearing in nearly all the publicity for the video game. The Pepakura PDO template for the helmet is available here. "Similar to Soul Gems, Azura's Star has the ability to trap the souls of non-humanoid creatures, known as "white souls". These souls can be used for enchanting and for recharging weapons." 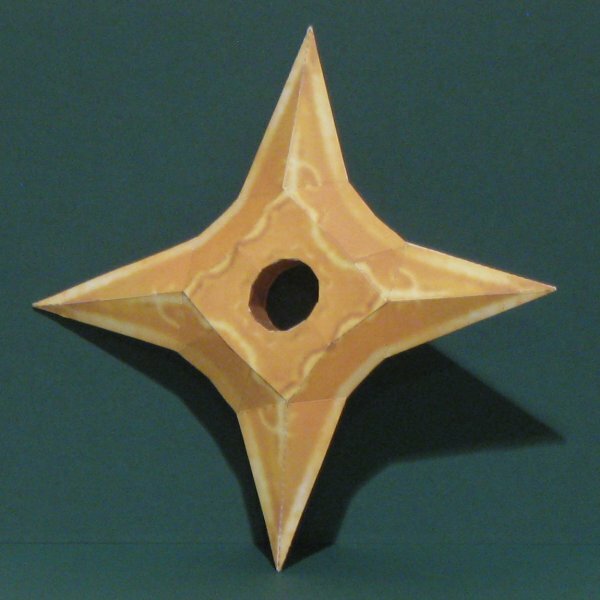 By changing the texture of the Pepakura PDO file, two different versions of the star may be created. The templates (both PDO and PDF) by papercrafter Brandon may be downloaded here. 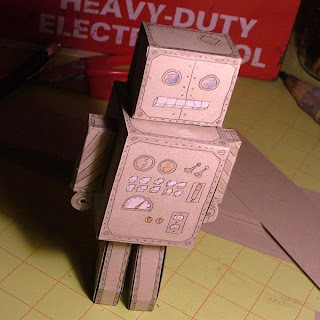 Here's a papercraft Johnny 5 robot. Johnny 5 is the main character in the Short Circuit movies that were released in 1986 and 1988. A special feature of this model is that it was designed to house a small remote control car in the base thus giving the robot the ability to move about the room. 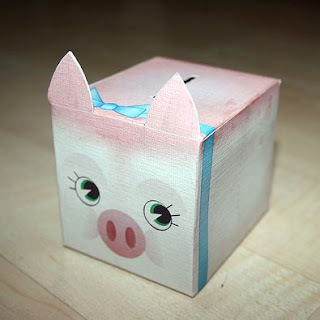 The glue-less papercraft template by Randyfivesix may be downloaded here. The 1980's animated British television show Danger Mouse follows the adventures of a one-eyed secret agent mouse and his trusty hamster sidekick, Penfold. 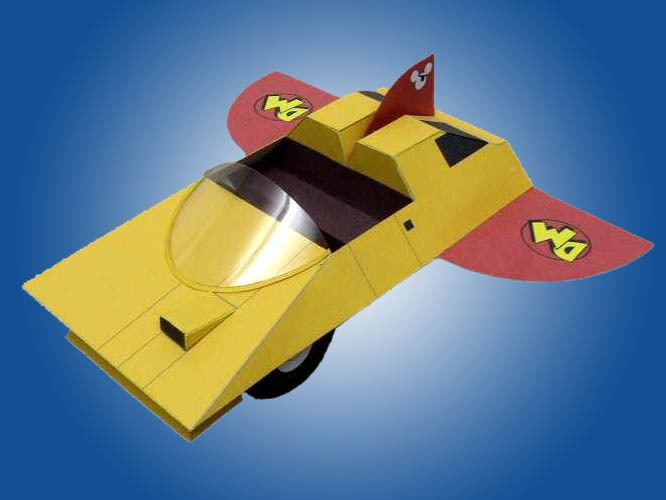 This paper model by Armada Model Designs recreates the duo's flying car. In the high tech car Danger Mouse is able to travel to locations ranging from the Bermuda Triangle to outer space. 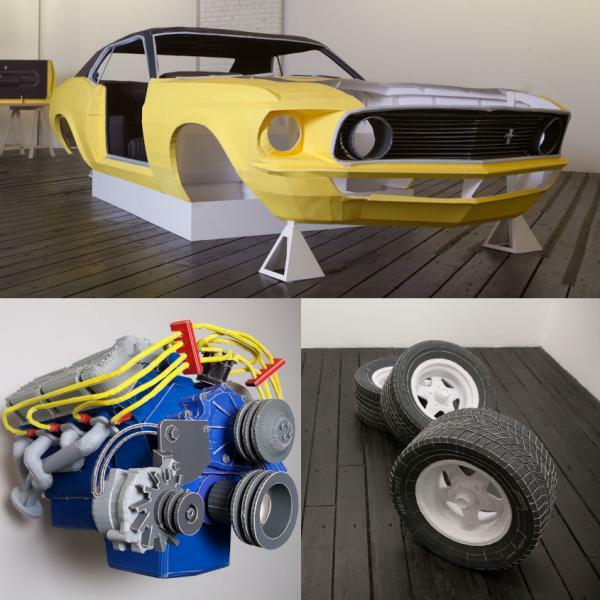 The template for the car includes instructions on how to build the clear plastic windshield. The official Sega website for all things related to Sonic the Hedgehog offers lots of free downloads. 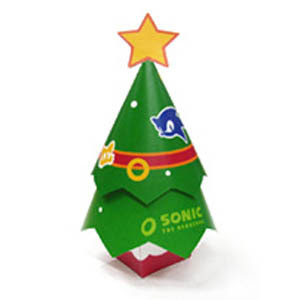 One download that is appropriate for this time of year is a papercraft Sonic Christmas tree. The template for the Christmas tree may be downloaded here. 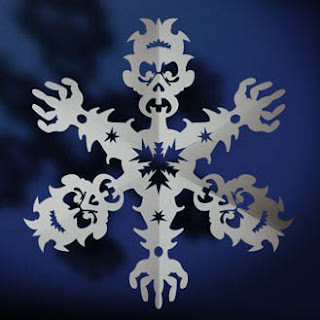 Hidden on the Snowdin website are four free snow related paper toys: A Saint Bernard rescue dog, a chalet, and my two favorites, Yeti and Evil Sheep. According to Snowdin: "The battle between Evil Sheep and Yeti is as old as the struggle between good and evil itself." Snowdin is chock-full of fun wintry activities. Don't forget to bring your 3D glasses along if you visit! The DC Comics character Green Lantern makes use of a power battery to charge his ring of power. 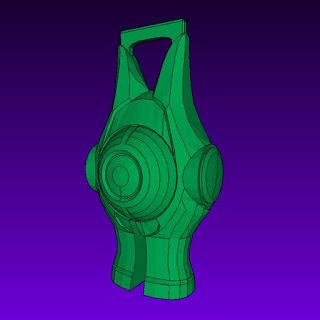 This paper model by Dungbeetle and Spartan_058 is of Green Lantern's power battery as it appears in the Green Lantern movie. The Pepakura PDO file of the battery is without color, but I was able to create a green version by changing the default color setting for the untextured faces of the model. The template may be downloaded here. 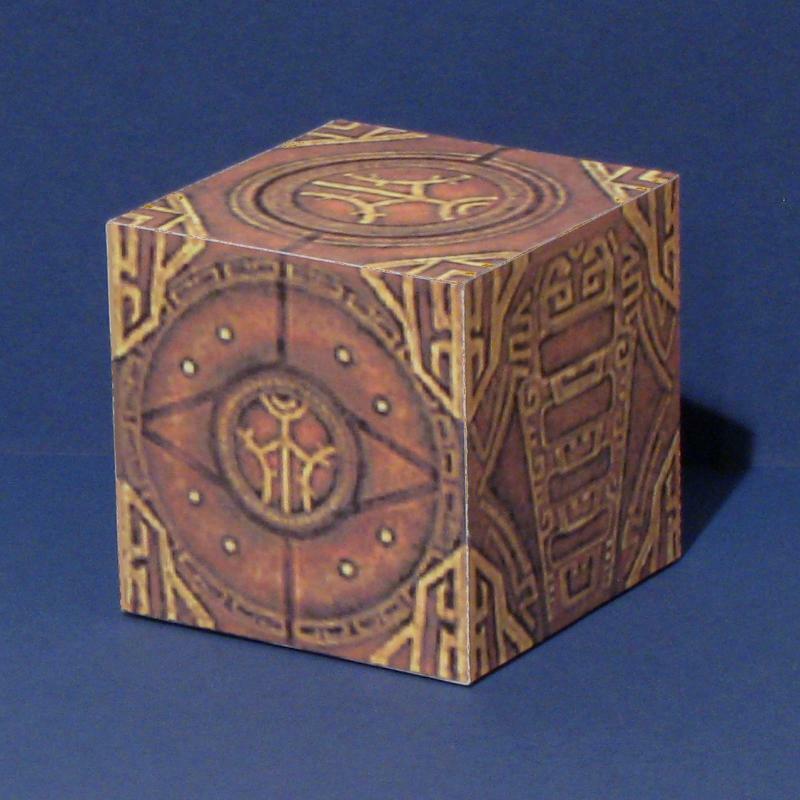 Here's another treasure chest papercraft from Kingdom Hearts 2. This chest can be found in the Olympus Coliseum area of the video game. Olympus Coliseum is based on the 1997 animated Disney movie, Hercules. The template for this treasure chest is available here. 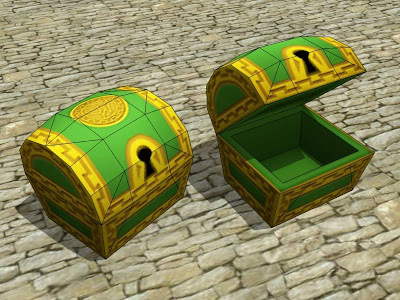 Some of the previous treasure chests in the series include: Aladdin, Mulan, and Disney Castle. Here's another great miniature gaming papercraft designed by Eddnic. 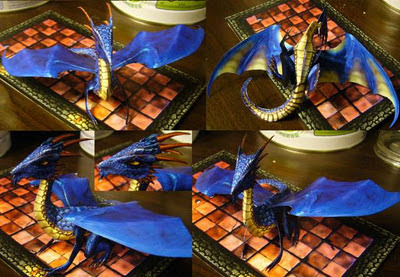 This blue dragon is a good illustration of Eddnic's 2.5D paper model work which is so well developed that it could be considered true 3D papercraft (or at least 2.7D ^^). A download of the blue dragon template is available here. In the 1979 sci-fi Disney movie, The Black Hole, three of the main characters are robots. 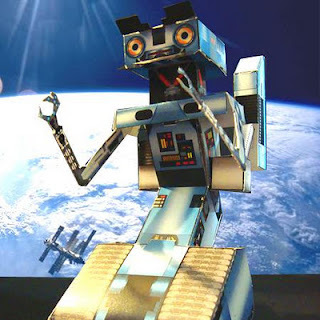 This paper model by Andreas Hanstein is of the robot named V.I.N.CENT. The papercraft template for V.I.N.CENT is available here. 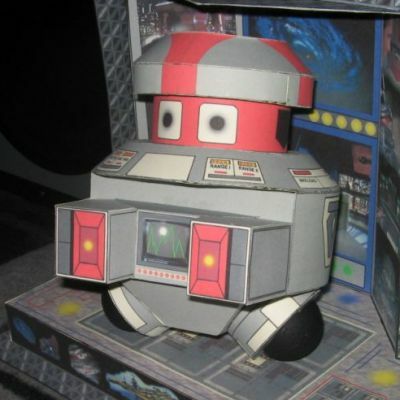 Two styrofoam ball halves painted black are glued to the bottom of the robot to give it the appearance it has in the movie. 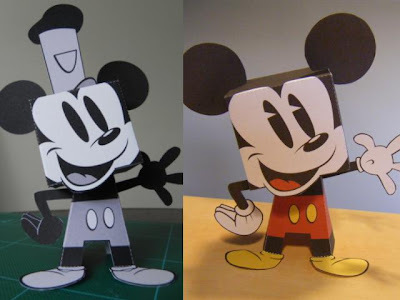 Back in 2009, designer Matt Hawkins created two Mickey Mouse paper toys. On the left is Mickey as he looked in his first cartoon, Steamboat Willie. On the right is the modern version of Mickey we all know and love. 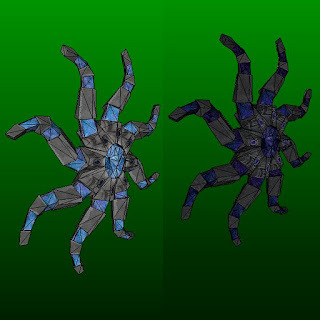 A download of the toys is still available here. 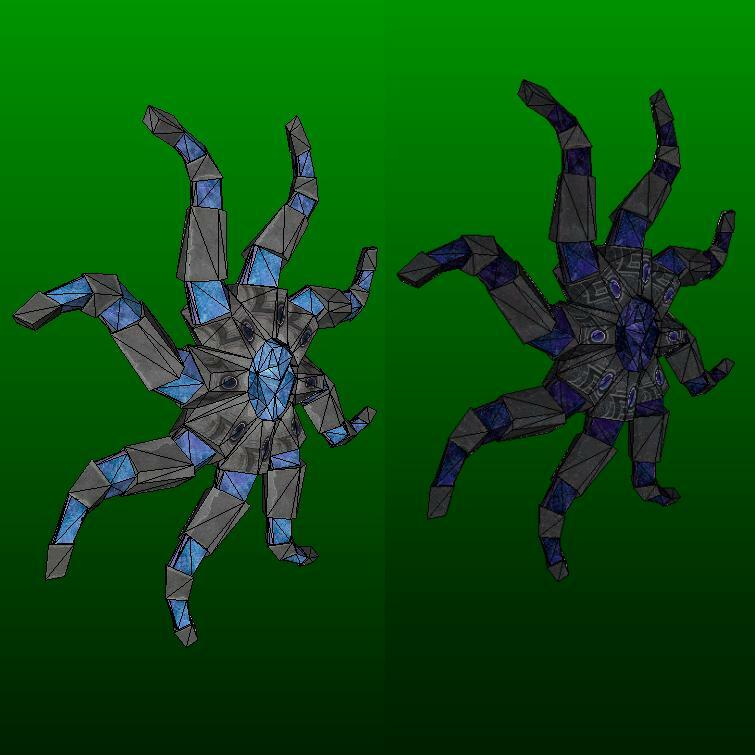 The zip file contains both the paper models pictured above and also a papercraft stage on which to display them. Build photos above are by George Dunkley and Methuup da Funky One. UPDATE 3/3/2019: Donald Duck and Goofy paper toys by Matt are available here. These velociraptors are much more cuddly than the ones in Jurassic Park. 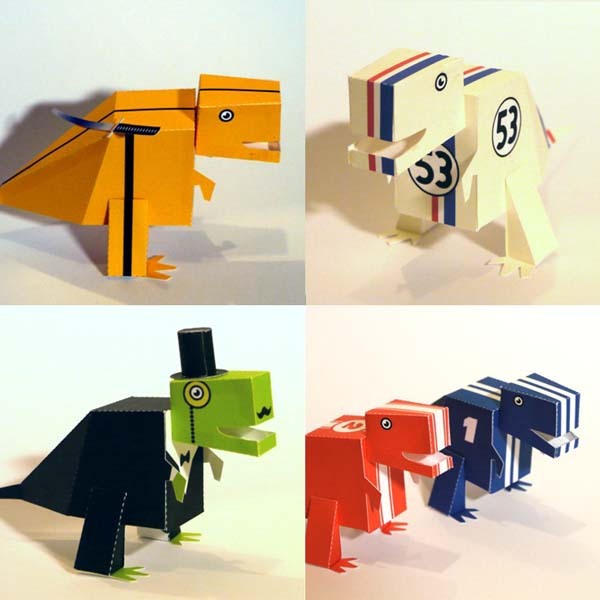 ^^ Included in the assortment are racing velociraptors, a Herbie the Lovebug velociraptor, a Kill Bill bride velociraptor, and my personal favorite, the gentleman velociraptor, complete with monocle and top hat. The creator of these humor laden dinosaur paper toys is Markus at Digiprop.com. 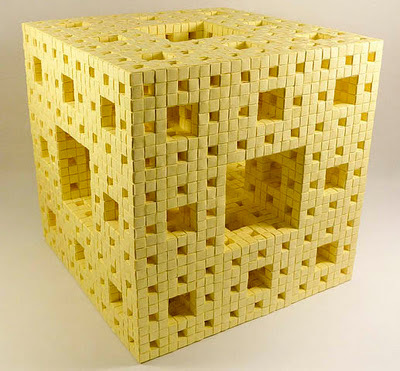 Nicholas Rougeux created a level 3 Menger sponge out of post-it notes and it took him a mere 867 days. ^^ I definitely don't have the patience to attempt this one. To give you an idea of the scale, each of the tiny cubes in the sponge is built from pieces that are 1/16 of a standard size post-it note. The finished sponge measures a little over 11" (28 cm) in each direction. A Menger sponge is a type of mathematical entity known as a fractal curve. 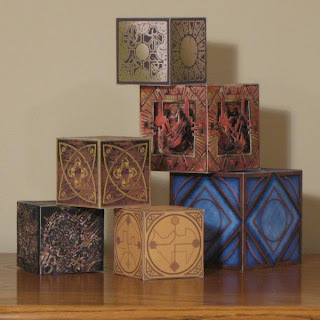 Instructions to build your own Menger sponge are located here. "Remember remember the fifth of November.." Today marks the third anniversary of Tektonten Papercraft and for the first time it occurred to me that this date is also Guy Fawkes Day, that uniquely British holiday that figures so prominently in V for Vendetta. The photo above is a collection of some the papercraft cubes I have featured over the past three years. In the coming year I hope to produce more Tron, Star Wars, and Kingdom Hearts/Disney paper models. 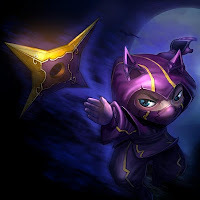 I also hope to start doing some League of Legends papercraft. Thank you everyone for your continued support of my humble blog! 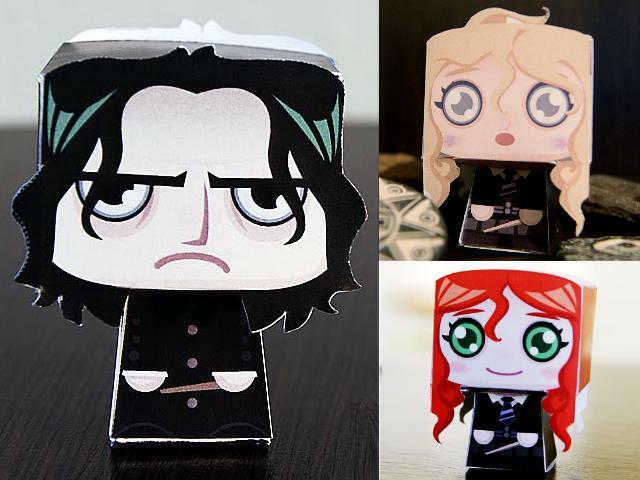 Gus Santome at Mini Papercraft has produced some delightful mini Harry Potter paper toys. The currently available toys include Severus Snape, Luna Lovegood and Lily Evans (Harry's Mom). Hopefully Santome will create more characters in the future. A fun feature of these toys is the fact that each one is double sided with a different facial expression on each side. 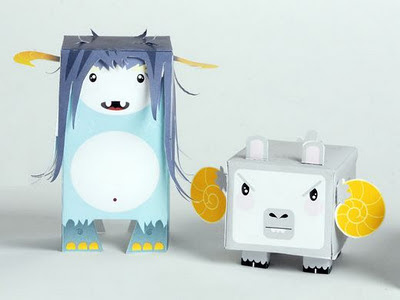 A download of the paper toys is available here. 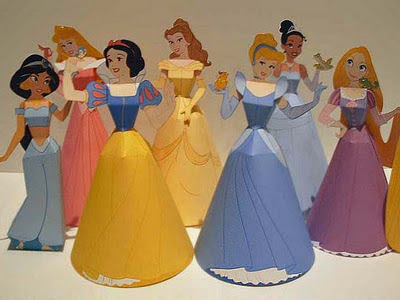 Hand drawn papercraft templates are a relatively rare item these days. So imagine my delight when I came across this hand drawn retro robot paper model by Theresa Rhorer. Theresa drew the template for the robot on brown paper then photographed the parts so other people could build one too. Theresa's template may be downloaded here. 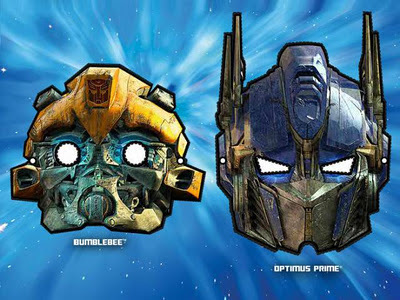 Two free printable Transformers masks are being offered by Hostess this Halloween. The masks offered include Bumblebee and Optimus Prime. The free mask offer is a promotional tie-in to the release of Transformers: Dark of the Moon on Blu-ray and DVD. The PDF templates for the masks may be downloaded here. 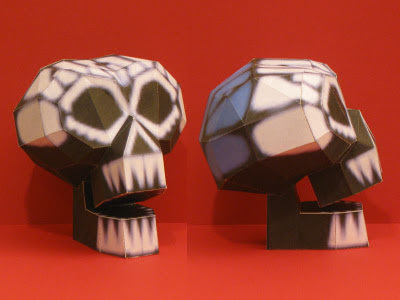 My second video game skull papercraft is complete! This skull appears in the shop in the League of Legends video game. League of Legends is a online real-time strategy (RTS) video game which was inspired by Warcraft III. 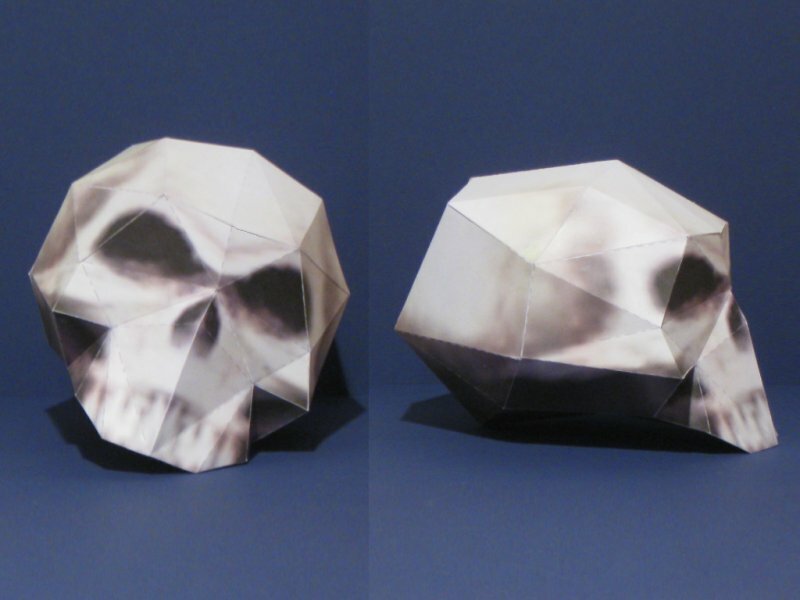 The size of this skull matches the size of the 1:1 scale Half-Life skull paper model I released previously. 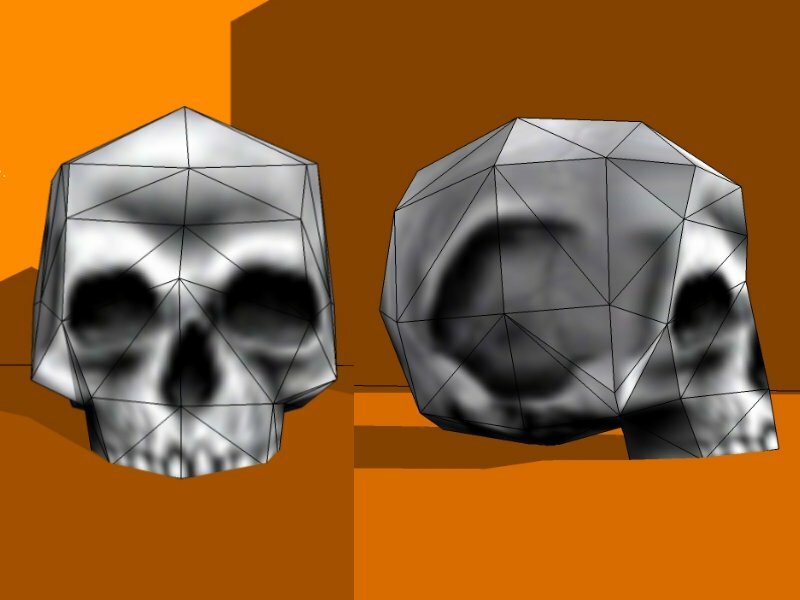 The PDF template for the LoL skull may be downloaded here. "The original car didn't run and I never drove it. The body and interior were completely refinished but not its mechanicals, making the paper version almost as complete as the original. The details of the car are based more on my memory and a few photographs. I no longer have access to the original car and chose not to use a surrogate to measure and get all the details correct. I like when things are slightly off, in the wrong place or missing, just like my memories of the original." Sorry, there are no downloads of the template ^^, but photos of all the parts of the papercraft car (including the doors, seats, instrument panel and spark plugs) may be found here. These Harry Potter paper models are the creation of Noturno Sukoi. 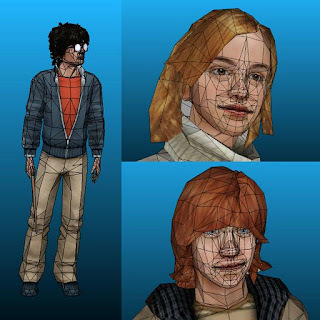 3D models from the "Harry Potter and the Goblet of Fire" video game were used as the basis of the papercraft figures. The models include Harry Potter himself, Hermione Granger, and Ron Weasley. When complete, each of the models stands around 15 3/4" (40 cm) tall. As is typical with much of Noturno's work, these papercraft models are recommended for experienced papercrafters only as customization of some pieces may be required in order to get the models to fit together properly. Templates are available in both PDF and PDO format and may be downloaded here. Cyclops has always been one of my favorite X-Men characters. This full scale papercraft of Cyclops' visor is the style of ruby quartz eyewear the character sported in the 90's. That was when comic book artist Jim Lee was drawing the X-Men titles for Marvel. The template for the visor is by Dancin' Fool and comes in Pepakura PDO format only. Also, unlike the picture above, the template is uncolored and requires either changing the texture of the PDO, printing on color paper, or painting after completion if you want the finished product to have color. The template may be downloaded here. UPDATE 6/18/15: A version of the visor template in PDF format may be downloaded here. Frankenstein's monster is a popular subject for paper toys. Above are a few of the many examples to be found on the Internet. 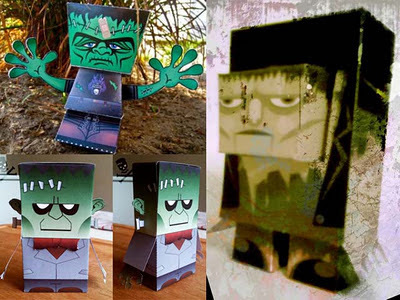 Starting in the upper left corner and going clockwise, we have an original Frankenstein paper toy by Shawn Sullivan. Next up is a Foldskool Heroes Frankenstein by Jerom. And finally there is papertoyFrank by Anthony Combexelle who runs misterfrankenstein.com. Here is October's offering in my continuing series of papercraft treasure chests from the Kingdom Hearts 2 video game. 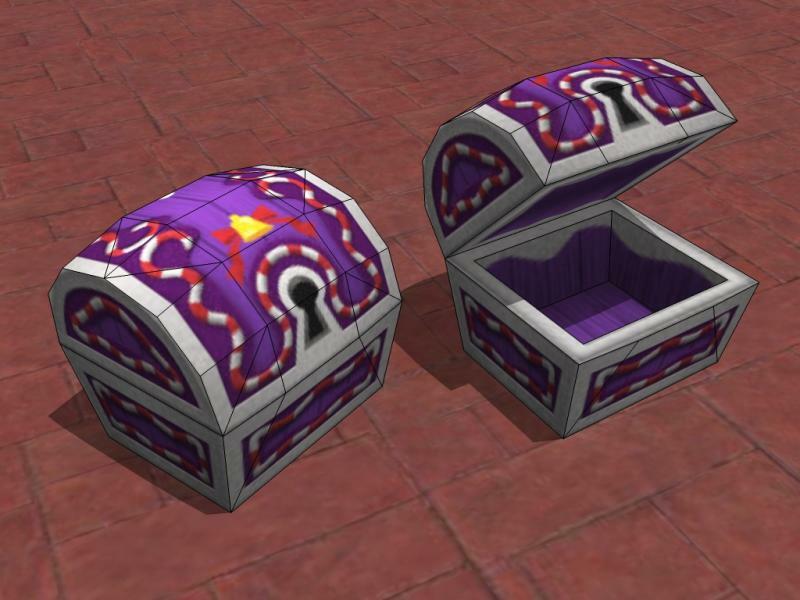 It was obvious this month that I had to do the treasure chest from the Halloween Town area of the game! ^^ Halloween Town is based on the world of Tim Burton's movie, The Nightmare Before Christmas. A download of the treasure chest's template is available here. How would you like this paper model (no pun intended) standing in the corner of your room? ;) The creation of papercrafter "Moonman", this awesome full scale papercraft is based on a 3D computer model from the fantasy themed MMORPG, Soul of the Ultimate Nation (S.U.N.) The character depicted is an "Elementalist", which is a class of character described in the game as "offspring of a mage group which has compiled magic books based on the four elements of water, wind, fire and earth". The finished model stands 5'-6" (168 cm) tall with a template consisting of 58 pages. The template comes in both JPG and Pepakura PDO format and may be downloaded here. UPDATE 10/17/2011: A version of the template sized for letter size paper is available here. The download is a single PDF file containing all 58 pages of the template. Be aware that a model built using this template will be slightly smaller than the A4 version due to the resizing required to fit to letter size paper. In the 1979 movie Moonraker, James Bond and Dr. Holly Goodhead pilot a shuttle (Moonraker 6) into space in order to stop the evil plans of antagonist Sir Hugo Drax. 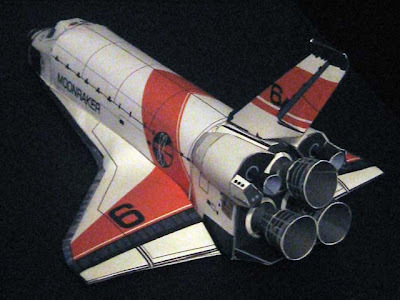 US space program enthusiast Alfonso X. Moreno has created a 1:144 scale paper model of the fictional space shuttle. 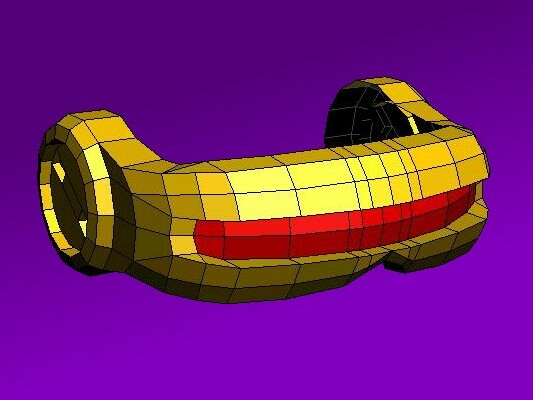 The template for the shuttle is offered as a free download on his website. 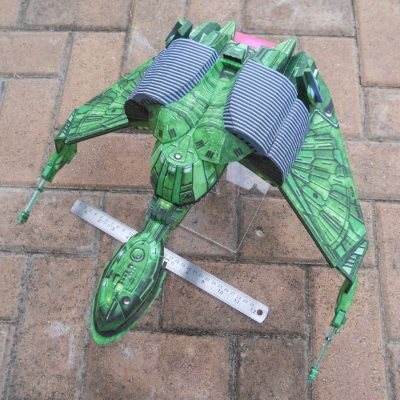 If you visit his site, be sure to check out Alfonso's many other detailed space program paper models. Over time, the Disney Family website has added paper models of most, if not all, the Disney Princesses. Below are quick links to the templates for the Princesses. Thanks to Cayley for doing the hard work of locating them all! 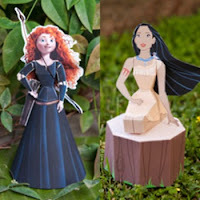 UPDATE 7/25/12: Pocahontas and Merida (Brave) have been added to the list! UPDATE 4/2/14: Elsa and Anna (Frozen) and sort-of-a-princess ;) Maleficent (Sleeping Beauty) are now available.